A while back, I was gifted a copy of Scrimish from a friend. He had been a Kickstarter backer of the title, and he generously gave me his second copy sent to him. While we both didn’t get the chance to immediately jump into playing, I have waited for some time to actually jump in on playing. I admit: the title threw me for a loop, and its simple rules on paper didn’t leave me with the impression to want to dig in. I generally play card games that seem more involved and usually sport intricately illustrated graphic design. It was only recently I gave the game a spin. So, what is it, and is it any good? 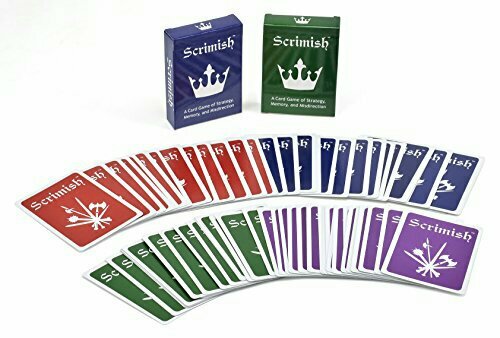 Quite simply, I’d say Scrimish is a simple card game with a strange name that evokes classics, such as War, Chess, & Memory, within a game time of 10-minutes, tops. As I said, it was originally a Kickstarter project, so it’s entirely possible you’ve missed out on it a few years ago and never heard of it. Still, if you like a game that offers a lot for very little, it’s hard to beat in my book. In it, you and your opponent each go for the other player’s Crown Card, hidden at the bottom of one of five piles of five cards. Depending on how you play, you can carefully choose what other cards are in what stack and where to begin, or you can shuffle randomly and hope for the best. As long as the Crown is at the bottom of one of the stacks, you’re ready to go. Every turn, you can peek at the top card of any of your stacks and choose one to combat the top card of one of your opponent’s five piles; pay attention to what you learn they have and where, because it can be used to your advantage. Mostly, it’s all a simple numbers game, where the larger number wins in any encounter. However, Archer and Shield Cards mix things up slightly. Anytime an Archer Card attacks, it wins, regardless of whatever card it faces; if attacked, it loses, no matter the other card’s attack power. Shield Cards can never attack, but they stop any level of attacker. With those basics in mind, the game is on. As you can see, Scrimish has some of the easiest rules I’ve ever encountered. The suggested age is 8+, but kids are sharp these days. I think most any kid can pick up on it all quickly, and its gameplay rewards carefully chosen strategy, while also allowing players to elect to leave it all to luck, if they so choose. Just like all the greatest games, it is very quick to learn, yet difficult to master. I’ve played kids and adults, and no one had any problems catching on in the slightest, and better yet, all greatly enjoyed the simplicity, flow, and length of gameplay. If you want to fit in one quick game, do it; if you want to make a night of it, the hook is deep enough to keep it going. Now, it can’t all be perfect, right? Well, the original releases are fairly standard when it comes to design. 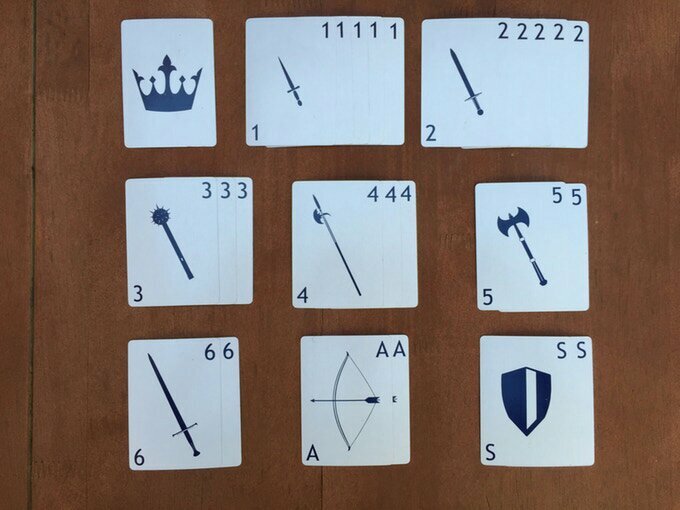 In fact, they appear basic and simplistic like the numbered cards in a standard playing card deck. Everything is one color on a white card, so that could be a turn-off for some. Luckily, the makers of Scrimish have addressed this with an upcoming “reskin” of the game with characters from “Pillars of Eternity” (see below). Like myself, you may not be all that familiar with that particular IP, but the more ornate art style and identical gameplay in that set addresses any issues with the monochromatic original decks. Also, while game sessions are quickly handled, it’s probably best played in an on-the-go “2 out of 3” or “3 out of 5” basis. I could see one getting burned out on a night of 20-30 consecutive matches, but really, what game could live up to that kind of frequency anyways? Still, it’s something to consider. While the reskinned version isn’t on sale at the time of this writing, I see the original-release Scrimish decks online for $10 and under; buying a two-pack makes the price even lower. While I have yet to play beyond two players, the game is open to allowing even larger multiplayer of 2v2, 3v3, and even “free-for-all” in whatever numbers you can get together. 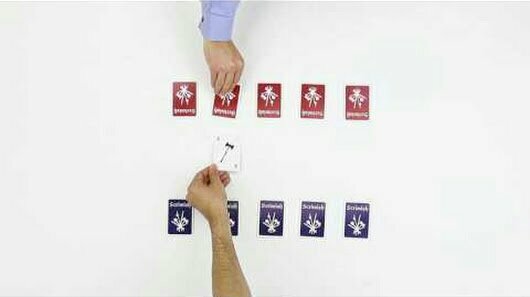 As long as a player has a deck, they can jump into the action, and there is no “CCG-advantage”; everyone has the exact same hand, laid out in their own way. That’s a very attractive prospect for players, new or old to playing, and it’s all only limited by how many people want to play. With a very low price point and the ability to add even more players with their own identical decks, I can’t speak highly enough about Scrimish! Don’t let the minimalist look steer you away; even if it is, wait it out for the soon-to-be-released “Pillars of Eternity” version, and pick it up then. Regardless, search it out, and add it to your repertoire of titles! I’m sure you can find a copy somewhere, but if I can recommend a great seller, Mark at Griffon Gaming in Hugo, Oklahoma can surely help you find what you need.